My daughter loves PRO-Kids Tangy Citrus Flavor 60 Time-Release Micro-Pearl by Hyperbiotics. It has a great flavor which makes it much easier for her to take daily. My kids love PRO-Kids Tangy Citrus Flavor by Hyperbiotics and I like that the pills are small enought that my 5, 8, and 9 year olds can swallow them for additional benefits. My son is 5 and can swallow PRO-Kids Tangy Citrus Flavor by Hyperbiotics without chewing since they are so small. And I noticed a change within a week or two of taking them. Hes been doing great since being on them! GIVE YOUR CHILD THE FOUNDATION OF A STRONG IMMUNE SYSTEM. From our modern dietary choices to our daily hygiene regimens‚ there are many things that can affect the balance of bacteria critical for healthy digestion and immune function. Proper probiotic supplementation can help repopulate your child's gut‚ help with nutrient absorption‚ and support their natural defenses‚ giving your child a solid foundation for a lifetime of health. KEEP YOUR CHILD HEALTHY. 80% of your immune system is in your gut. PRO-Kids probiotics help restore your child's beneficial bacteria for digestive and immune health. DRAMA FREE AND EASY TO SWALLOW. This very tiny pearl is the smallest on the market and is easy to swallow for most children of chewing age and up. PRO-Kids pearls are most effective when swallowed rather than chewed (though they still taste great if chewed!). PREMIUM PROBIOTIC SUPPLEMENT. Avoiding the synthetic and sugar-loaded ingredients you know are not beneficial for your child can be quite a challenge! You can rest assured because PRO-Kids is sugar free (sweetened with stevia) and has ZERO artificial colors‚ flavors‚ or sweeteners. ·	4 Targeted Probiotic Strains (including Lactobacillus and Bifidobacterium) because bacterial diversity is key when it comes to gut health. 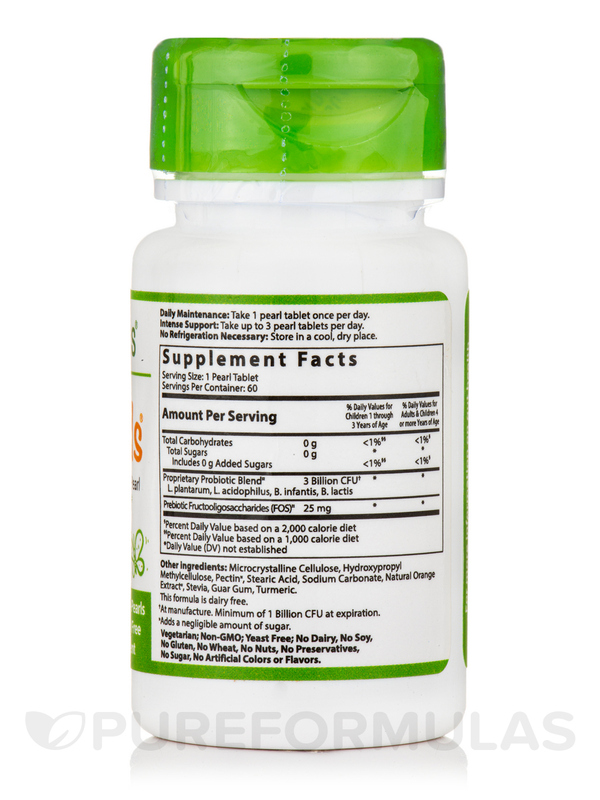 PRO-Kids also includes B. infantis‚ the powerful probiotic found in breastfed infants‚ for targeted support. ·	3 Billion Colony Forming Units per BIO-tract pearl - which is equivalent to 45 Billion CFU (colony forming units) of standard probiotic capsules! ·	Easy to Swallow. This very tiny pearl is the smallest on the market and is easy to swallow for most children ages 4 and up. PRO-Kids pearls work best when swallowed rather than chewed‚ though still taste great if chewed! They can also be hidden in food or even crushed and then mixed with cold foods. ·	Naturally Derived Prebiotic included in each pearl to help feed the probiotics for increased potency. Prebiotics are fibers that encourage the growth of beneficial bacteria throughout your colon. ·	Long Shelf Life & No Refrigeration Necessary. With the patented LiveBac manufacturing process‚ our formulas have an extended shelf life with zero refrigeration. ·	Only Once per Day. That's it. Because with time-release delivery‚ the full benefits are being delivered deep inside your child's gut hour by hour. ·	Made in the USA. Our probiotics are manufactured in Washington and Colorado in facilities that are GMP certified through NSF. We adhere to the strictest quality control and FDA guidelines and perform rigorous testing on every lot to ensure they are survivable and as the label states. ·	Choose Premium & Sugar Free. This formulas is vegetarian‚ non-GMO‚ and free of lactose‚ gluten‚ and yeast. There is also no soy‚ sugar‚ iron‚ nuts‚ artificial flavors‚ artificial colors‚ or preservatives. L. plantarum‚ L. acidophilus‚ B. infantis‚ B. lactis. Other Ingredients: Microcrystalline cellulose‚ hydroxypropyl methylcellulose‚ pectin‚ stearic acid‚ sodium carbonate‚ natural citrus flavor‚ stevia‚ guar gum‚ turmeric (color). May contain trace amounts of the milk protein casein from the fermentation process. Vegetarian / Non-GMO / Yeast-Free / Lactose-Free / Soy-Free / Iron-Free / Gluten-Free / Wheat-Free / Nuts-Free / Preservatives-Free. Daily Maintenance: Take 1 pearl tablet once per day. PRO-Kids is most effective when swallowed rather than chewed. Ideal for children 4 years and older. Intense Support: Take up to 3 pearl tablets once per day. Ideally suited after a course of antibiotics. No refrigeration necessary. Once opened‚ store in a cool‚ dry place. As with any dietary supplement‚ consult your health professional. Do not use if tamper seal is broken/missing. Choking Hazard. Not for children under 3 years to swallow whole. Allergen Caution: May contain trace amounts of the milk protein casein from the fermentation process. 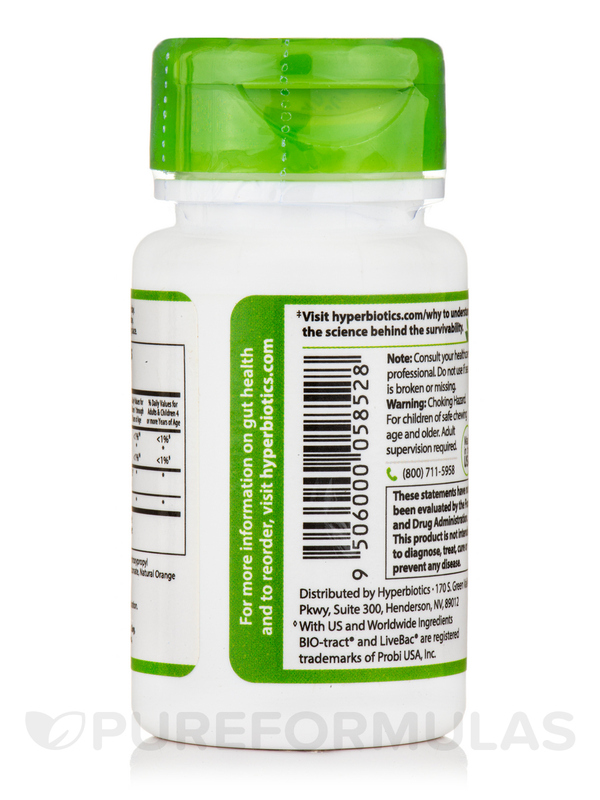 PRO-Kids Tangy Citrus Flavor by Hyperbiotics has really seemed to help my son with his digestive issues! Love it - works fast! 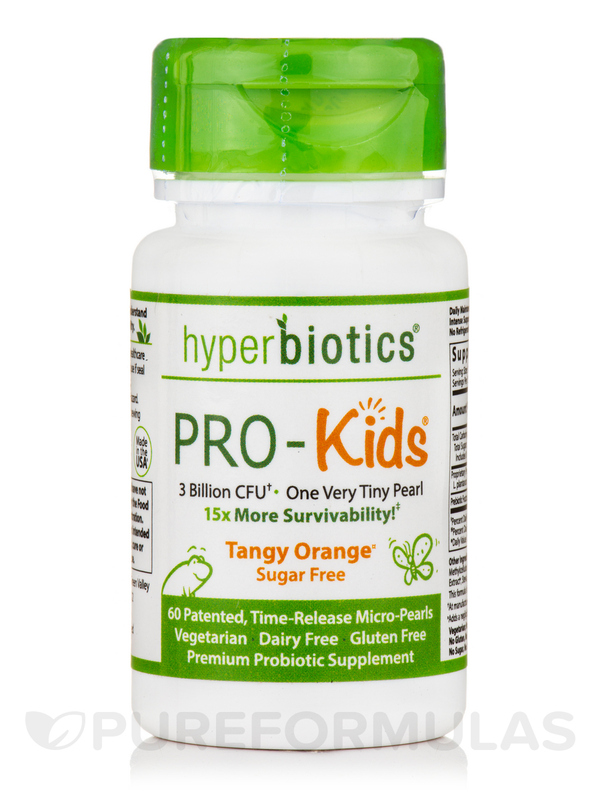 This PRO-Kids®, Tangy Citrus Flavor by Hyperbiotics is the best one I've found for kids. It is designed to stay intact long enough so that it's not destroyed by stomach acid. It travels where it needs to go to be most effective before it opens up and delivers healthy bacteria into the gut. It works!! The way it's designed to work more effectively. Easily to swallow as they are tiny little orange pearls- but it can also be chewed if necessary. Tastes great and kids love it. It's very effective and my kids won't be without it. Hi Dody, thank you for choosing Pureformulas. The expiration date that is for the PRO-Kids as of right now is 08/17 (August, 2017).